I've always loved making interesting little bites for parties and other happy gatherings, and consider this the most exciting and interesting of all cooking challenges. Making ten or twelve platters of beautiful, fresh, zingy bites for a party is finicky work and takes many hours and a lot of planning, but there's little to beat the satisfaction you feel when you watch your guests fall like starving puppies on the food, emitting yaps of delight at every mouthful. 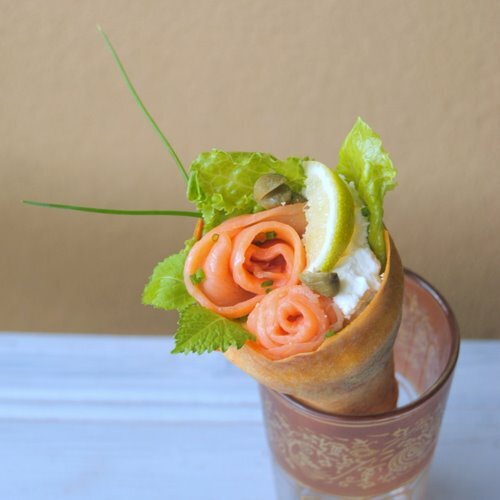 For several months now I've been thinking about how to make a small savoury cone. I love the clever and simple design of an ice-cream cone: it's easy to hold, lovely to eat and imbued with all sorts of good seasidey childhood memories. So why not, I thought, serve little 'bouquets' of food in crisp pastry cones? They can't slip out of your fingers, or slither off a plate, and you can grab two or three at a time without having to put down your glass of wine. 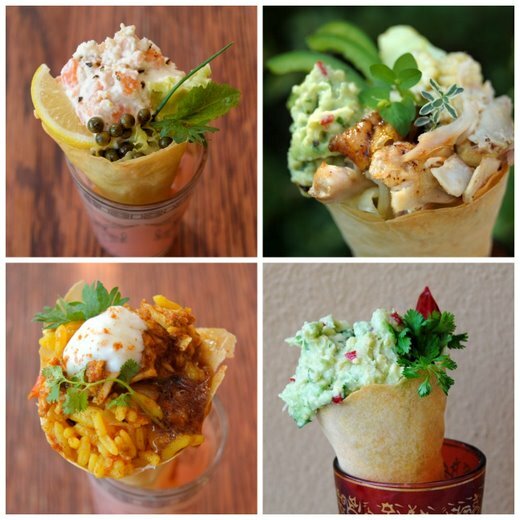 Clockwise, from top left: Smoked Salmon Dip with Green Peppercorns; Roast Chicken with Baby Corn, Guacamole and Marjoram; Hot Chicken Curry with Rice, Chutney and Yoghurt; Guacamole with fresh Coriander. I abandoned ordinary puff pastry and phyllo pastry almost immediately, because the first wasn't firm enough to hold its shape and the second was too delicate and temperamental. Spring-roll pastry, which you can buy in any Chinese food store, was ideal, but I couldn't figure out how to mould it into a perfect cone that could be baked. In the Forties and Fifties, you could buy tin moulds for cream horns in any kitchen shop, but these are a rarity nowadays. After experimenting with cardboard cones of various designs (all of which were failures) I found the solution: commercial ice-cream cones, wrapped in foil. I expected the cones to collapse in the heat of the oven, but they didn't, and I've found that you can reuse the same foil-wrapped cones up to three times before they disintegrate. Rolling the pastry around the cones and removing the moulds is, I have to warn you, fiddly, and takes some practice, but once you've got the hang of it, you can easily turn out several dozen in under an hour. If you're adding a semi-wet or soggy filling to these cones, they should be filled no more than 10 minutes before you serve them. Dryer fillings (for example, smoked salmon or roast chicken) can be added an hour or so before. Fill the bottom part of each cone with torn green leaves (such as rocket, or cos or butter lettuce) that have been thoroughly dried. Don't use a watery lettuce such as iceberg, which will make the cones soggy. If you're anxious about the cones becoming soggy, take them out of the oven four minutes before the end of the baking time and, using a pastry brush, paint beaten egg all over the inside of each cone. Return them to the oven and bake for a further four minutes. This will 'waterproof' the insides. You can use either one or two sheets of pastry for each cone. Single-sheet cones are more difficult to make, but are beautifully light and delicate. Double-sheet cones are more robust, and suitable for heavier, wetter fillings. For extra flavour, sprinkle finely grated Parmesan and some salt and pepper between the layers. As there are bound to be some failures the first time you try this, I suggest you make 16 foil-covered moulds to allow for duds. To serve the cones, arrange them upright in narrow-sided bowls or vases, or in individual shot glass or (as I've done in these pictures) in tea glasses. Heat to oven to 180ºC. Take the pastry out of its plastic packaging and wrap it in a slightly damp tea towel. Place the roll of tin foil on your counter. Using a pair of scissors, cut 12 square pieces of tin foil (to measure out the squares, fold a bottom corner of the foil up to meet the top edge of the foil strip, as you would do if you were making an origami square). Take the first square of tin foil and lay it on the counter. Place an ice-cream cone on its side, narrow end pointing towards you, on the right-hand edge of the foil square. Pick up the edge of the tin foil and roll the cone in an arc to the left, gently squeezing the foil against the cone to enclose it completely. Twist the top open end, as if you were twisting the end of a Christmas cracker, and then gently prod the twisted end down into the wide end of the cone. You'll use this 'handle' to pull the mould out of the pastry casing; make sure it's a big, sturdy twist of foil, or it will break off. Repeat this process with the remaining eleven cones. Lay a piece of clingfilm or greaseproof paper on the counter and smear it with a light film of vegetable oil. Sprinkle with a little salt (and pepper, if you like). Place a sheet of spring-roll pastry on top, and sprinkle with a little more salt. If you're making double-sheet cones, place another sheet of pastry on top, and brush again with oil. Brush a stripe of beaten egg, using a pastry brush, across the bottom edge of the pastry square (the edge closest to you). Now wrap the mould in the pastry in the same way you wrapped it in foil: place a foil-wrapped cone, narrow end facing you, on the right-hand edge of the pastry sheet, half a centimetre away from the bottom edge. Fold the bottom edge of the pastry over the thin end of the cone, then pick up the right edge and wrap it firmly around the cone as you roll the cone in an arc to the left. Stretch the pastry a little, tucking it under as you go, or you won't get a tight wrap. Press firmly on the the egg-washed edge to seal the cone. Now trim the top open edge of the pastry with a pair of sharp scissors to that it protrudes 5 mm above the tim of foil-wrapped mould. This takes some practice to get right, but do persist! Don't worry if there's a little gap at the thin end of the cone. Place the pastry cone, seam side down, on the lined baking sheet. Repeat this process with the remaining 11 cone moulds. Bake the cones at 180ºC for 12-15 minutes, or until they are crisp and golden brown. Remove from the oven and allow to cool for a minute or two. Grasp the twisted end of foil in one hand, and the pastry cone in the other, and gently pull the foil-covered mould out with small yanking movements. If you can't get the mould out, gently snap away any rim of pastry overlapping the mould. Place the cones on a drying rack and allow to cook completely. See my notes above for storing and filling filling the cones. How absolutely gorgeous and unique - such a treat! These are definitely unique. Can't wait to try them.